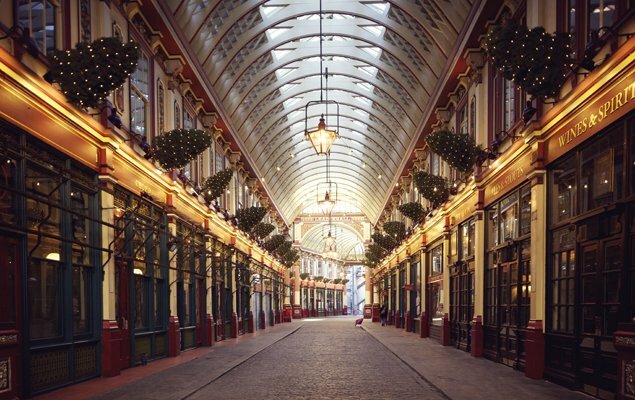 London’s Leadenhall Market at Christmas time. Image by Aurelien Guichard. 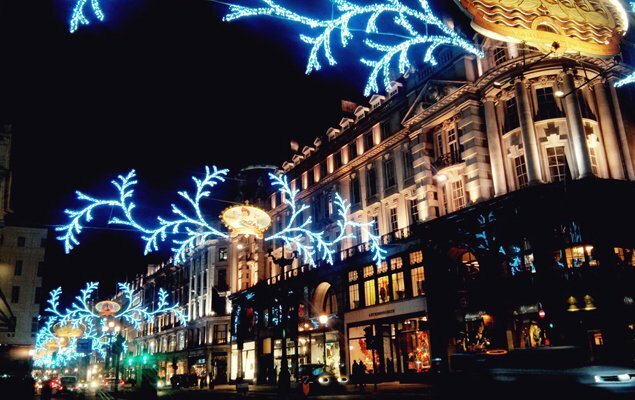 The holiday season in London is a truly special time of the year, especially for shoppers! The city’s most popular shopping areas all get swept up in the holiday spirit with beautiful light displays and decorations, special events and amazing sales. If you’re lucky enough to find yourself in London this winter, here are the best places to visit for holiday shopping in the city. 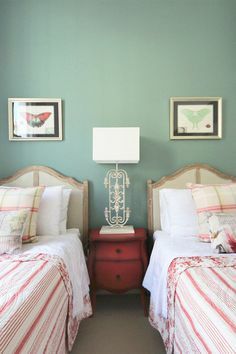 Image by Jill Donker Curtius. Visitors and locals alike have turned to Oxford Street for their holiday shopping needs for well over 100 years. The lengthy thoroughfare is one of the busiest shopping streets in Europe and is home to popular British department stores such as John Lewis, Debenhams, Marks and Spencer and the famous Selfridges. Around the holiday season Oxford Street is probably best known for its dazzling Christmas light display. The tradition dates back 56 years and is marked with a grand celebration complete with live music and celebrity appearances. This year Australian singer Kylie Minogue appeared to flip the switch on 1,778 snowball decorations strung over the street containing an incredible 750,000 LED light bulbs! Don’t Miss: Founded in 1909 by an American entrepreneur, Selfridges helped put Oxford Street on the map and still stands today as one of London’s finest luxury department stores. On the other end of the spectrum, the Primark flagship store on Oxford Street is an excellent place to pick up bargain fashions and accessories, and is a hit with teens. If the holiday shopping crowds start to feel overwhelming, duck into the alleyway just past James Street and head to St. Christopher’s Place. The quiet pedestrian alleyway is home to a great collection of independent shop and offers respite from busy Oxford Street. 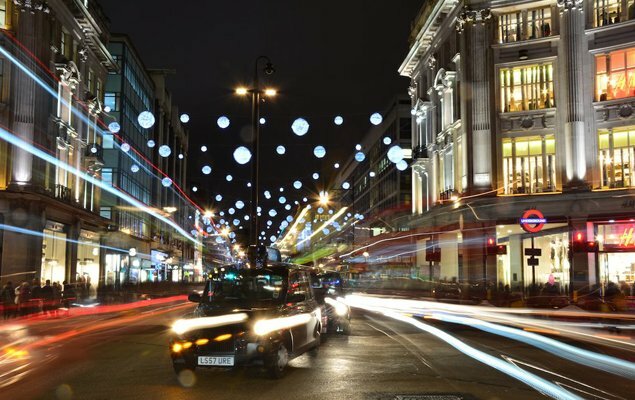 Not far from the splendor Oxford Street, Regent Street is another shopping hot spot famous for its annual holiday lighting display. Each year in November the lengthy street is lined top to bottom with elaborate illuminated decorations all tied together by a single theme. Popular themes in recent years have included the 12 Days of Christmas and Night at the Museum. What this year’s theme is going to be is anyone’s guess, but you can find out on 15 November when the lights are switched on. Don’t Miss: With its mock Tudor facade, you should have no problem spotting Liberty of London on Regent Street. The store is a treasure trove of beautiful items and Liberty’s branded fashion accessories make excellent gifts. If you have children on your shopping list, you’ll want to stop by Hamleys. The toy shop has occupied a spot on Regent Street since 1881 and its plush teddy bears are famous the world over. Just a short walk from Oxford and Regent Street, Carnaby Street is a pedestrianized shopping area best known for its off-beat atmosphere. The street enjoys a colorful history and was widely the epicenter of mod and hippie fashion in the 1960s. That legacy lives on to this day, as the area is still home to an eclectic mix of independent shops, UK designers and ultra-hip international brands. 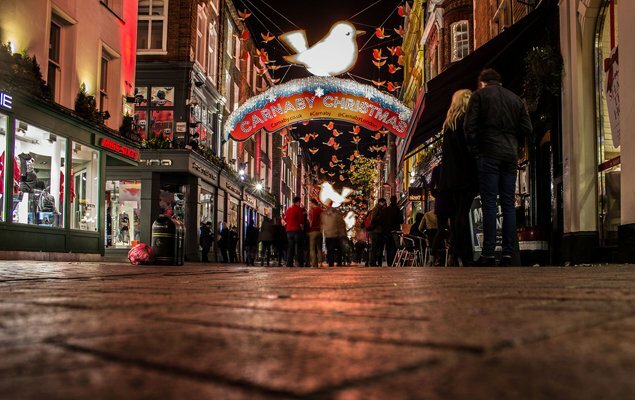 Don’t Miss: Carnaby Street kicks off the holiday shopping season by switching on its lighting display and hosting a massive party. This year it will be held the evening of 12 November and you can get your free ticket here. During the party you can get a head start on your holiday shopping and enjoy 20% off at 120 stores in and around Carnaby Street! A treasure trove of luxury gifts and gourmet treats, the area around Piccadilly is often overlooked by visitors as a shopping destination. 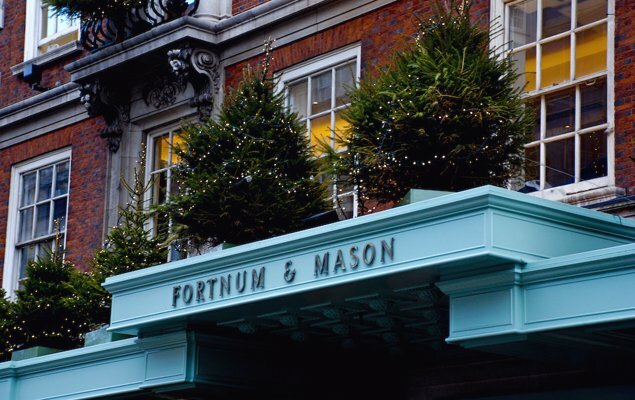 One store you simply cannot miss during any trip to London is Fortnum & Mason. The department store specializes in gourmet foods, luxury home wares and decor. Just exploring its interior space, with all its elegant details and touches, is a pleasure. Another true gem of the Piccadilly area is Burlington Arcade. The historic covered shopping hall offers a tantalizing selection of luxury shops, including La Perla, Chanel and Ladurée. If it’s men’s fashion you’re after, you’ll also want to take a stroll through Jermyn Street where you’ll find a host of tailor shops, shirt makers and proprietors of leather goods. 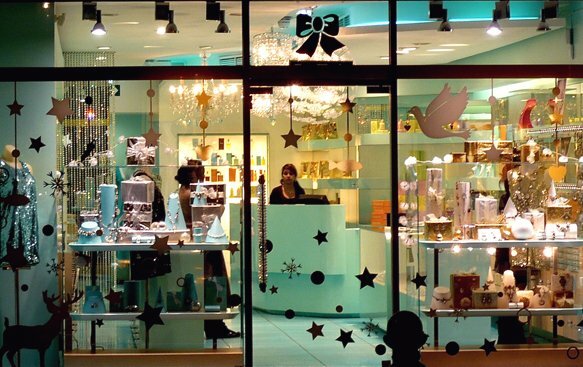 Trendy Knightsbridge is home to some of the chicest boutiques and department stores in London. The most famous is, of course, Harrods. 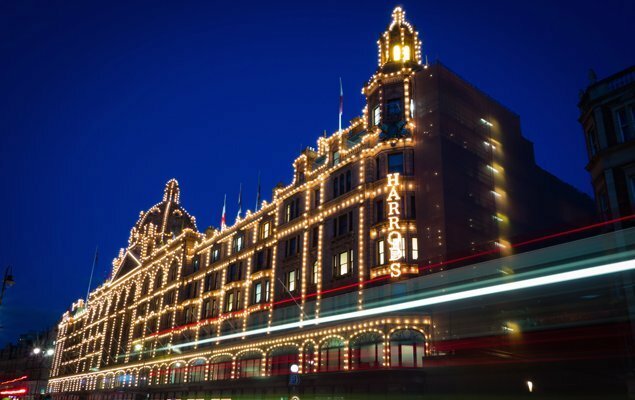 Harrods takes the holidays to a whole new level with its opulent Christmas displays and glittering interiors – this is luxury shopping as only London can offer. A little further up the road, Harvey Nichols offers an impressive selection of fashions. Don’t Miss: Most Knightsbridge shoppers stick to Brompton Road, but it pays to get off the beaten path. Venture to Lowndes Street and Motcomb Street to discover boutique shopping and chic restaurants in a village-like atmosphere that feels worlds away from busy Central London. 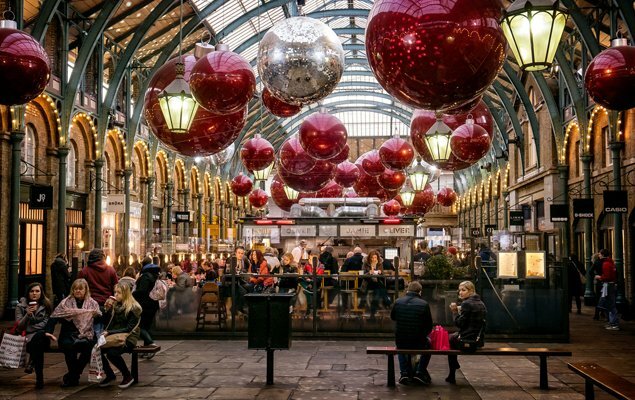 Covent Garden is another area of London that really embraces the holiday spirit. Filled with great shops, great restaurants and charming cafes, you could easily spend the whole day here. Things really kick into high gear starting on 12 November, when Covent Garden switches on its dazzling light display. Hundreds of thousands of individual lights illuminate the Piazza, which also features a sky-high hand-picked Christmas tree. If you’re visiting over the weekend, don’t be surprised if you run into a few real life reindeer brought in for children to pet! Don’t Miss: Soak in the holiday atmosphere along Long Acre and don’t forget to make your way to colorful Neal’s Yard. This is where you’ll find the flagship store of Neal’s Yard Remedies, a specialist in organic skincare products only available on this side of the pond. Kensington’s major shopping thoroughfare is Kensington High Street. A scaled down and calmer version of Oxford Street, this is where West Londoners go get their shopping done. The street is anchored by a few major stores, including Marks and Spencer and Whole Foods. Mixed in among the restaurants and cafes are popular retail brands hailing from the US, UK and Europe. Branching off from Kensington High Street, Kensington Church Street enjoys lighter crowds and is home to higher-end boutique shops. Don’t Miss: Browse for bargains at TK Maxx on High Street Kensington. The sister company of TJ Maxx in America, the Kensington branch has an enviable range of discount designer goods. If you’re craving American holiday food, Whole Foods has a great selection of seasonal favorites, including pumpkin pie! 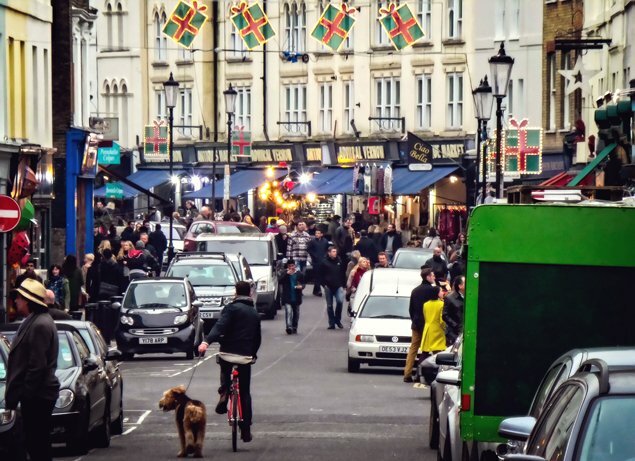 Notting Hill is very much a year-round shopping destination, but it really can’t be beat around the holidays. Open as usual, Portobello Road is home to countless antique and book shops. You could easily spend a day here browsing for treasures and stopping in at cute cafes to warm up and refuel. Also not to be missed in this charming London neighborhood are the independent boutiques of Westbourne Grove and Ledbury Road, where you won’t have any problems finding gifts for everyone on your holiday shopping list. 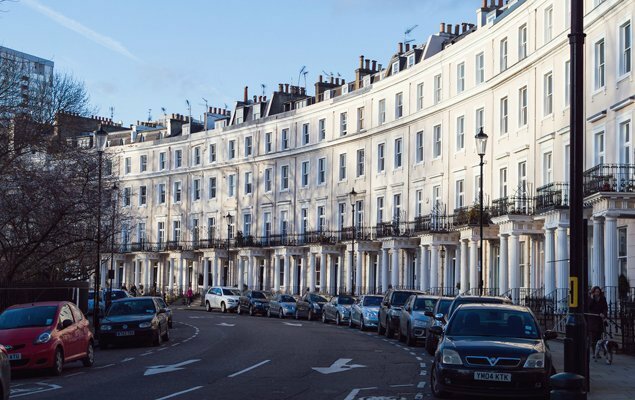 Running through the heart of chic and fashionable Chelsea, King’s Road is one of the finest high streets in London, and a more upmarket alternative to Oxford Street. The lengthy thoroughfare is home to department stores, international name brands, boutiques, and a host of luxury retailers. At the end of King’s Road sits Duke of York Square, a modern shopping square with dozens of popular fashion and accessory outlets. Don’t Miss: The Designer Christmas Sample Sale held in the Chelsea Town Hall is scheduled for 12 December and gives shoppers the opportunity to save up to 90% on designer goodies. London is home to several world-renowned museums, and their gift shops are a great source for unique stocking stuffers and presents to take back home with you. The V&A Museum and British Museum commission their own unique products lines – many of which are hand made in the UK – and offer a really great range of gifts and decor in the run up to Christmas. 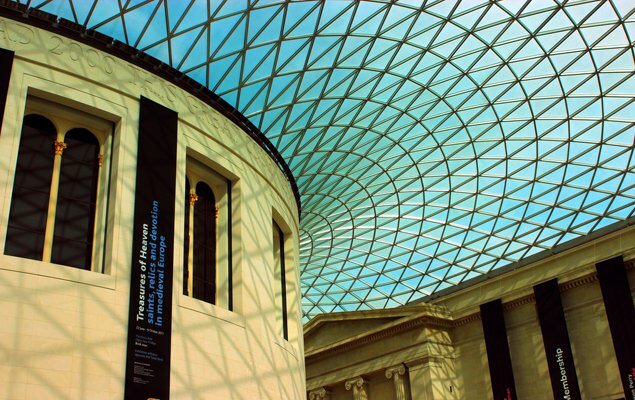 Other museums with great gift shops include the London Transport Museum (near Covent Garden), Tate Modern and National Gallery. London’s specialty Christmas markets offer a dose of holiday cheer with European flair. 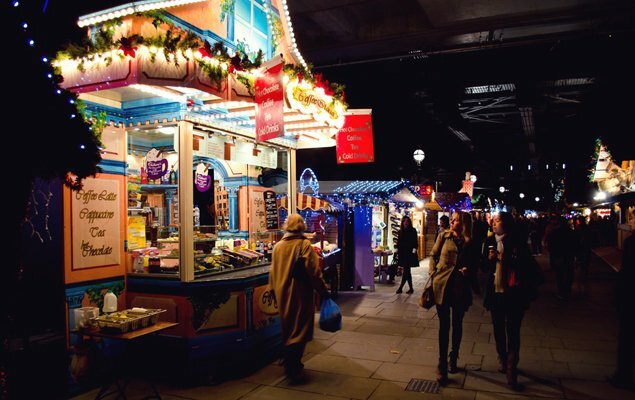 The most popular is the Southbank Centre Christmas Market, which opens on 11 November. The market is made up of a long row of traditional wooden chalets along the Thames. Sip hot chocolate or mulled wine as you browse festive treats, handmade holiday decorations and unique gifts. There is an old-fashioned carousel for kids and you can also pair your visit to the market with an ice skating session and trip around the London Eye. 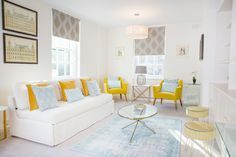 PREVIOUS: Long-Term Stays Now Available at the Stunning Gladstone Apartment! Posted on Wednesday, December 9th, 2015 at 6:09 pm in Shopping. You can follow any responses to this entry through the RSS 2.0 feed. You can leave a response, or trackback from your own site.